The Ruger Precision Rifle (RPR) has been a big hit. Since its introduction in 2015, this modular rifle has become the top-selling, tactical-style bolt gun in the USA. And now RPR owners have a new trigger option for their rifles. 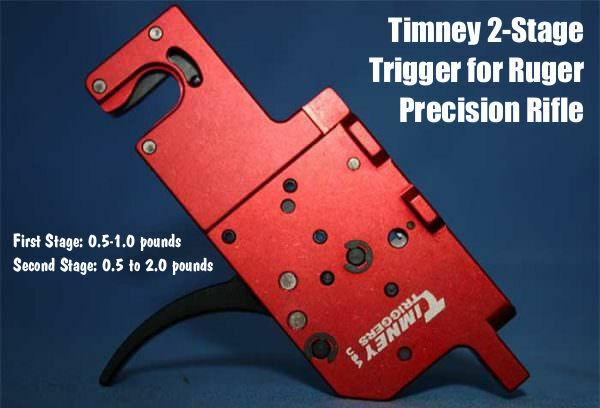 Timney Triggers has just released an affordable drop-in, two-stage RPR trigger. We expect many RPR owners will choose to upgrade their rifles with this new trigger, priced at $219.95 MSRP for either curved or straight trigger shoe. The trigger comes pre-set with a 1.5-lb total pull with one pound in the second stage. 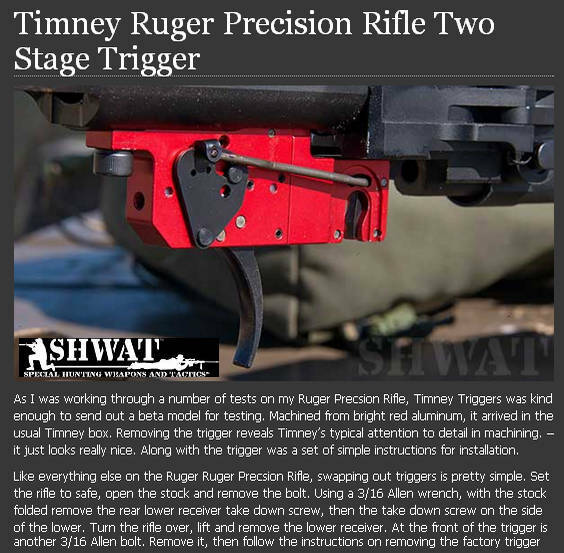 Timney is now taking orders for the RPR trigger via TimneyTriggers.com. These triggers are crafted with advanced production methods. For example, the sear is wire EDM-cut and then Teflon-nickel coated. The new Timney RPR trigger is a self-contained, 100% drop-in trigger ready to install in your Ruger Precision Rifle for an exceptionally smooth, crisp, two-stage trigger pull. No gunsmithing, fitting, or adjusting required. The pull weight is factory-calibrated for a half-pound first stage and a one-pound second stage. The first stage is user-adjustable from 1/2 pound to one pound and the second stage is user-adjustable from 1/2 pound to two pounds. The trigger is offered in straight and curved trigger shoe models. The trigger housing is constructed of military-grade, 6061 T6 alloy that is CNC-machined using state-of-the-art robotics and is anodized for superior durability. The trigger is also CNC-machined, heat-treated and coated. The sear is wire EDM cut, heat-treated to 58-60 Rockwell and Teflon-nickel coated for lubricity and dependable, long-lasting service life. Share the post "Timney Releases Two-Stage Trigger for Ruger Precision Rifle"